TO REDEEM OFFER: Add qualifying in-stock items totaling $75 USD or more to your shopping bag. Enter offer code SHIPVS75 at checkout. Standard shipping & handling charges will automatically be deducted for eligible orders after offer code is applied. Valid March 20, 2019 through March 24, 2019 11:59pm PT. 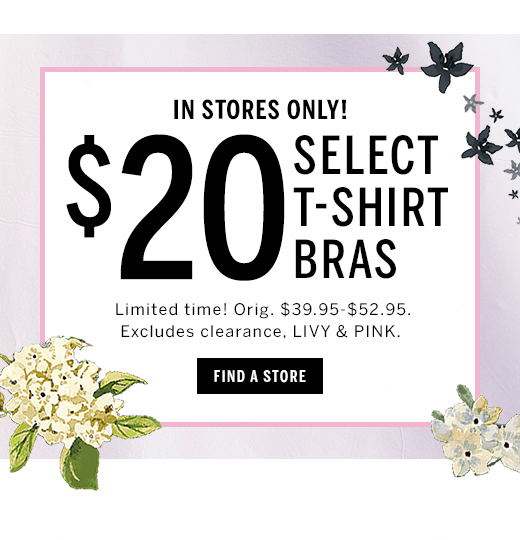 OFFER EXCLUDES THE FOLLOWING: Shipping & handling, taxes, gift cards, gift wrap & kits and Victoria’s Secret designer collaboration products do not qualify towards the purchase requirement. Not valid with any other shipping offers, previous purchases or store purchases. ADDITIONAL OFFER DETAILS: Valid for standard shipping & handling anywhere in the United States. Offer subject to adjustment due to returns, cancellations and exchanges. Offer may be modified or discontinued at any time without notice. *$25 off when you open and use an Angel Credit Card between March 15th – March 31st, 2019. Subject to credit approval. Not valid for existing Angel Credit Cardholders. Not valid on previous purchases or as payment on Victoria's Secret Angel Credit Card. The Victoria's Secret Credit Card is issued by Comenity Bank. In-store: Valid on first in-store purchase when opening a Victoria’s Secret Angel Credit Card account. Online: Must provide valid email address and US mailing address at time of application. Offer will be received by email.